It’s time to get engaged, and one of the highlights of the engagement is flashing that gorgeous diamond ring. As the soon-to-be bride-to-be, you’re all set to say “yes." And the best part – instead of purchasing an engagement ring, you and your fiancé have decided to use a family heirloom engagement ring instead. Hold on sister. Before you accept that heirloom engagement ring, you may want to think twice. While the idea of an heirloom engagement ring may ooze with romance, accepting the gesture can be more of a headache than it’s worth. Yes, You Love Him, But . . . These days, an engagement ring is an asset. And with the divorce rate as high as it is in America, couples unfortunately have to think about divorce before they even get married. The reality of failed marriages – not to mention failed engagements – must not be ignored. Sure, you don’t think it will happen to you, but no couple does. Accepting a family heirloom as your engagement ring will carry heavy sentimentality with it. If you and your beloved decide to part ways, and the ring is his Aunt Betty’s, he’s going to want the ring back. Etiquette says you should give the engagement ring back, but legally, some states will require you to do so. And if the ring is from your side of the family, now the heirloom is tainted with the history and pain of an engagement or marriage that didn’t last. And who’s gonna want the ring after that? Before the proposal is made and that heirloom engagement ring is slipped on your finger, you and the groom-to-be may need to take a couple of steps that could dull the pending nuptials. First, whether the heirloom engagement ring belongs to your side of the family or his, you must get permission to use it. This alone can stir family controversy if a sibling or another relative feels the heirloom belongs to them, or the parents possessing the heirloom are less than supportive of the engagement. Worse yet, if you ask for the family heirloom, you’re turned down and given a substitute that you don’t like, you can ruffle quite a few feathers by saying no thanks. But if you accept the back-up, you are stuck, for a lifetime, with a diamond engagement ring that you don’t like. Next, if the heirloom is not a ring – like a brooch, hairpins, bracelet or earrings – you have to take the stones from the jewelry piece, design a ring, find a jeweler to make it, and undergo the expense of having it made into the diamond ring you want. Sure you’ll have an authentic ring, but you will have spent enough money and time to make a down payment on a house and start building it. Even if the heirloom is a ring, you likely need to get it specifically fitted for you. With all of the tasks on the to-do list for your wedding, purchasing an engagement ring could be much less hassle. And when you buy your own engagement ring, you’re creating your own heirloom that can one day be passed along to a member in the next generation of your own family if you choose. So what is the heirloom engagement ring solution? If the idea of not using the family heirloom might break your heart, or a family member already broke your heart by refusing to give you the heirloom for your engagement ring, don’t despair. The idea is not completely a lost cause. Here are a couple of suggestions. 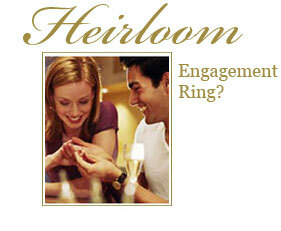 Engagement Decoy – Use the heirloom to propose and wear it until you get your “real" ring. This way, the engagement ring is part of your romantic courtship, but the owner of the piece gets the ring back. Knock-Off – Make a replica of the heirloom that you love so much. If imitation is the best form of flattery, this is the ultimate compliment to the owner of the original. And, while you are replicating the existing design, you can customize your diamond engagement ring to fit your signature style. Postpone – Especially if the parents who own the heirloom engagement ring have doubts about your marital union, you can strike a deal with them: If you stay together as a couple for five years or ten years – the number is up to you – then you and hubby get the family heirloom. Not only does this quell any ill feelings, you’ll know that you’re getting an antique ring for your anniversary that year. Many years ago, women felt it an honor to be given the engagement ring or another sentimental heirloom of a woman in her or her fiancé’s families. These days, brides are more opinionated about every aspect of their wedding, and the ring she’ll be wearing for the rest of her life is no exception. Do yourself a favor – save the heirloom for your big anniversary party 10 years down the road, and start your own tradition with a diamond engagement ring that reflects your personal style and is a unique expression of your love for one another.